The National Concrete Masonry Association is celebrating 100 years. We have been long standing members, starting with the 1st generation of White Block Company, Inc. and continuing today. NCMA provides us with testing, technical support as well as promoting our industry at the national level. They are displaying lots of information on their website showing the history of masonry construction. Take a look here - National Concrete Masonry Association. White Block Company, Inc. was founded on February 20, 1947 by twin brothers Edward and Harold White. 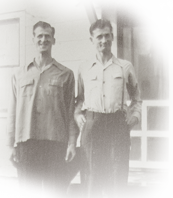 After being honorably discharged from the Army after World War II , their original plan was to open a heavy duty truck & equipment repair shop. But due to the lack of building materials in the area, they decided to invest in a hand operated block machine that was capable of producing 600 concrete masonry units per day. The blocks sold as fast as they were made, indicating they had made a wise decision. Over seventy years later, the plant has tripled in size and currently covers over ten acres. White Block Company can produce over 28,000 concrete masonry units per day at full capacity. We can manufacture over 200 different types of block on our Besser V12 machine. Some examples of what we make are Smooth Standard Units, Architectural Splitface & Groundface Units, Allan Block and Stonewall Retaining Wall Units, Chimney Block and a number of Specialty Block. Through the years we have added a full line of pre cast materials such as Parking Bumpers, Drywells, Catch Basins and Septic Tanks. White Block Company also carries a full line of masonry accessories including tools, sacked goods, masonry cleaners and sealers, and other miscellaneous building materials. In 2019, we are celebrating our 72nd year in business supplying Masonry, Landscape and Precast products to our customers and the Inland Northwest. We look forward to working with you on your project! Give us a call or come by, we are happy to help! White Block stocks a full-range of retaining wall blocks from Allan Block, StoneWall, and more. Click for more information. White Block Company offeres a full range of fence products including Allan Block and others. Click to learn more. White Block's Big Rock Block allows you to build taller gravity walls from 6 to 12 foot heights without geogrid. Click to learn more.